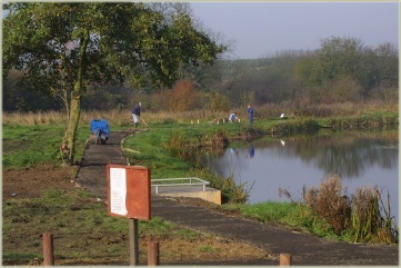 During 2007 Toftholders were advised by Thoresby Colliery Angling Club (TCAC) of the difficulties being experienced by some anglers with disabilities. 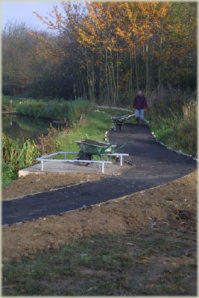 The two existing disabled fishing platforms were on the opposite side of the Dam to the entrance, and a barrier – erected because of vandalism and litter dumping – had created additional problems. It was agreed that this situation must be addressed. After some discussion it was decided, subject to funding being available, the TCAC would carry out the work of converting two conveniently situated platforms to make them suitable for wheelchair use; additionally the footpath around the dam, historically uneven and muddy, would be widened, levelled and surfaced with a suitable non-permanent material. New and appropriate signage would complete the project. Toftholders agreed to seek funding, do all the relevant paperwork, and monitor progress; an approach was, therefore, made to ‘Awards for All’ the Big Lottery Fund, and in August 2007 we were notified that we had been awarded a grant of £2690.00 to carry out the work. 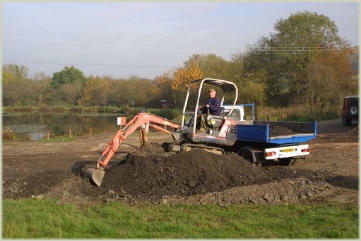 This was the whole sum estimated to be required for materials and machine hire. The Fishing Club and Toftholders, for their part, agreed to carry out the work stipulated to the Dam, to complete reports as required, and to make a record of the project on the village website. At the time of writing (March 2008), the new platforms are in place and the path finished. Because the cost of materials and machine hire exceeded the estimate the new signage is not yet completed, and more fund-raising may be required. 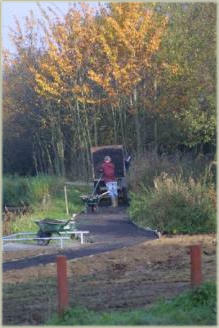 This does not, however prevent anglers with disabilities from enjoying the new, easier, access to fishing platforms, nor does it detract from the ability of people with pushchairs or with difficulty walking from circumnavigating the dam in a way which has not been possible before; both this website and the Fishing Club have received very positive feedback about the changes from wheelchair users. We are very grateful to Awards for All for their prompt response to our request for help, and hope that more people can now enjoy the environment of Wellow dam, whether they are angling or walking.